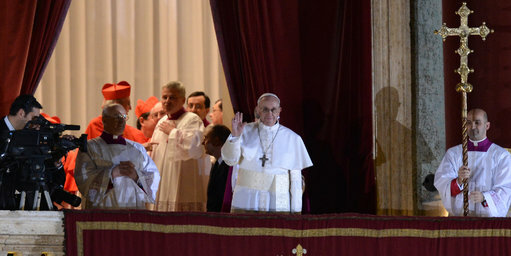 On Wednesday, March 13, 2013 at 2:04PM EST white smoke rose indicating that a new Pope had been chosen. Not long after Cardinal Jorge Mario Bergoglio, now known as Pope Francis I appeared to massive crowds and addressed them in kind simple words, asking for prayers for himself for the long journey ahead. Pope Francis I has lived a simple life and has always put the poor first. Please join us in welcoming him and leave your message or comments using the form below. DEAR POPE FRANCIS I AM HOPING YOU CAN HELP THE PEOPLE OF CLEVELAND OHIO OUR BISHOP SEEMS TO BE DOING THINGS THAT ARE CAUSING US TO LOSE FAITH. AFTER CLOSING 50 OF OUR CHURCHES DUE TO LACK OF PRIESTS HE IS FORCING FATHER BEGIN TO RETIRE AT 75 EVEN THOUGH HE WISHES TO STAY ON AND IS IN GOOD HEALTH. I AM 74 AND NEVER HAVE WRITTEN A BISHOP LET ALONE A POPE BUT I BELIEVE YOU CAN HELP US. This pope seems soo understanding, humble, and truly deserving the title. My fiance and I were just listening to ‘Higher’ by the Band Creed and it made us both think of Pope Francis! God Bless You!! Hi there. Congrats on securing this domain I’m a Catholic scholar and am interested in publishing a user-friendly access point for engaging Pope Francis’s messages and writings; I also run http://popebenedict16.com. I’d like to be in touch, if you’re willing. Not sure how you plan to use the site, but I’d be very willing to help in your efforts..
May God guide Pope Francis well. I have to say I’ve never seen such excitement around the election of a Pope. After reading up on him on Wikipedia and CNN and the like, I have to say I really like this man. God has given us a new shepherd. we are truly blessed. Praise the holy spirit. God bless and guide you. May He give you good health. Enjoy your ministry with the Lord. God bless u more, Pope Francis. May the Holy Spirit guide you in all your undertaking. We love you. 55 -according to the promise he made to our ancestors — of his mercy to Abraham and to his descendants for ever. Like Mother Mary, and in the footstep of St Francis of Assisi God has chosen Pope Francis I to lead the church in humility, to restore peace and to make Christ known to the ends of the earth. Praise God! Viva Papa Francis I! may the good God protect & guide him to lead God’s flock to Him.Noel Nonis. Praying for you always from now on. God bless all of us! MAY YOU BE ABLE TO UNITE THE CITIZENS OF THE WORLD TO RENEW OR CHANGE THE FACE OF EARTH FOR THE GLORY OF GOD. LONG LEAVE POPE FRANCIS! WE LOVE YOU..PLEASE ALWAYS PRAY FOR US. Your Holiness, Congratulations on your election and look forward to the Church contining to move forward under your reign. I look forward to all your new initiatives in helping the poor and spreading the food source around the world to feed everyone. thoughts and prayers each day. I look forward to hearing more and reading your messages to us. God bless you and keep you safe. Many Blessings to Pope Francis, keep us the people with you. Could you ask us to pray with you once a week the whole community together as one ? May God’s love continue to enlighten your way. May we, the people of the church you now guide, find the integrity, justice, transperancy and respect we have yearned for in our church under your guidance. I was very encouraged to read you washed the feet of two people. There is still hope and love in the world. That was a gesture much like Jesus. Keep up the good work! I am sure ou already know that many will be against some of the things you do. But, they would lso perhaps be against what Jesus di or would do. Best wishes in your leadership and may God continue to guide you as I know He is. Christ is everything and everything we are and have must be found in Him alone. The Mandy Thursday event of Pope Francis has brought him close to the heart of not only all women but all suppressed .Long Live our dear Pope .We are blessed to have him as our Pope .He is an icon of Popes . Welcome Pope Francis. I have a question and the answer may be part of Church doctrine. First of all, I am a 62 year old Catholic. I will in an Assisted Living community for over 2 years now, mostly because of my disabilities, not my age. We have a Catholic run worship service here every Saturday morning, and all denominations are welcome to attend. We have a well rounded service, to include a bible reading with comments and discussion, a special time of offering support, prayers and attention for those we know who are in need and suffering, and receiving communion. There are quite a few of us who do not understand why those attending, who aren’t Catholic, can’t receive Communion when they believe in the meaning of the Eucharist, and are good Christians. I just don’t believe that Catholic doctrine is so strict as to deny these good people from receiving Jesus, when he turned away from no one. You could refer to Mark 3: 1-5 to read one place in the Bible that mentions how Jesus accepted all no matter their background. Doesn’t this show that Jesus wanted all to receive his body? I believe that He was all forgiving and all accepting, and wanted all who believe to partake in Him. I hope someone there has listened to what I had to say, and will answer my question. Thank you for reading this and for your response. Hello, you seem like you will be a good pope. A red tie over your white cloth would help people relate. I’m not a Catholic, but I can’t help liking this Pope. I think it was very generous of him to say what he did about atheists, and I am personally interested in whether he would extend the same sentiment to polytheists. God Bless Pope Francis-who shows mercy and gives the poor a voice. Thank you for leading God’s people with the Love and Grace of our Savior, Jesus Christ. I feel that you have brought peace to our world. Please pray for peace among all of our Lord’s people around this beautiful world for which he has given us to live. In my eyes, we are as flowers in God’s garden, all beautiful in our own way, and yet, so many different nations of families around our world, it is truly amazing. You have ask us to pray for you, and we certainly will, and do every day. Thanks Be To God! Pope Francis 1, You sound like a very good man. I think it is wonderful that you are so humble and still wish to have a simple life and help the poor. And now you said that all good people whether they have a religion or nothing, will go to heaven. My mother believed that too. God bless you….It can’t be easy being Pope. I thank you for all the good you have done and will do. We pray for you daily, and know how hard your new job is, as Pope. Thank you for excepting the awesome responsibility that God has requested of you. The world being what it is, I’m sure you must feel that you are extremely alone, but we support and love you. Please pray for America. There are those of us left, in this great country, who remain faithfully loyal to the Church and it’s teaching. Welcome Pope Francis. You are the change our church has been seeking. I would like to have you help all the people attempting to enter the church but cannot because of previous marriages and there are blocks to be being baptized because paperwork has not been finished. Would Jesus keep these people away until they got their papers in order ? We need to change and streamline the annulment process in order to truly welcome everyone into our Church. I am not catholic but so far I have been very impressed with Pope Francis. I see a good man here. I agree with his idea that so much food is wasted. I have had to go to food banks on occasion and there is very little there that is handed out as there are so many people in need. I have gotten a bag of rice, beans a loaf of bread and canned vegetables. That is once a month and though it helps it does not go far. God Bless him for bringing the waste to the worlds attention. God bless Pope Francis. ALSO God bless the people of God. The abused(in gross ways) pettie ways. God give the priests an upgrade in emotional training and understanding of humankind. Not just words. The human heart, others hearts are brused, bleeding and tried of the jokes the priests make about serious stuff. on. And 3 card monty. Where the pea. I truly know you have a mission from our Blessed Mother. PLEASE HURRY and consecrate Russia to Her Immaculate Heart. Please do not delay as the world will face nuclear destruction. Please gather all the bishops. This is more important than anything. Unlock the secret of Fatima! Consecrate Russia!! We beg you, with your Bishops, consecrate Russia to the Immaculate Heart of Mary per Her request in Fatima. Like Moses, like and one with Our High Priest Jesus, God is with you. What is bound on earth is bound in Heaven – fulfill Our Mother and Queen’s requests! Together with our Eucharistic Lord, with the poor, your brothers, your children are in dire need! We are praying for you, we count on you!! Praying Our Lord and Our Lady always lead and protect you and The Church! Pope Francis1 is such a great man, I LOVE the new image of our Pope that he is creating, giving up the glitzy seat for a wooden one, kissing the feet of women, and letting the down syndrom boy into his Pope Mobile, what a great example of humility, like Jesus. He is the best example of Jesus that I have seen in a Pope. LONG LIVE POPE FRANCIS1 !!!!!!!!!!!!!!!!!!!!!!!!!!! i have been away from the church for 20 years but you are making me think about a return.we are here to fight for the poor and the weak. thank you sir. Thank you for removing some of the trappings of the Papacy and for your simplicity/humilty and most of all for your care/concern for the Poor. I’ll continue to remember you in my Prayer. May the Lord sustain you. I’m a Religios Sister of the Presentation of Our Lady founded by Nano Nagle in Cork Irelan in 1775. Thank God for you. Let,s get things done and have fun. Praying for you. We are so blessed to have you as our new Pope. Your humility truly resembles that of our Lord and Savior, Jesus Christ. I am so proud now to identify myself as Catholic because of your leadership and love for the poor. You don’t just talk the talk, you walk the walk (as they say here in America). For many years I have been saddened that our leaders have forgotten the ways of our Lord, but you are changing all of that. Hopefully, others will follow your example. May God Bless you and give you the strength you need for your work! Sir I am impressed by you and your total commitment to your faith. You give Catholic’s a good name again. I am a Lutheran but still give to catholic charities and because of a leader like yourself I will give more. You are truly a role model for other leaders, God bless you. Blessings upon you, Pope Francis! We have awaited you, and now, with God’s Holy Grace, it is time to unite the world in peace and love. I live in New Zealand and I am going home to visit my family in Scotland in Sept/Oct 2013. You are such an INSPIRATION to me and to the world, especially to Africa. You give new HOPE and PEACE to God’s world. Be assured of our continued prayers for you and your ministry. May God bless you abundantly. From an Anglican Priest and his people in Africa. I was to be in Rome this month with my symphony director. There was not a large enough group so Educational tours transferred me to another group in June. I was in Rome on June 19, 2013. Since I had only a two month notice I do not believe I would have received a ticket to see you. Two ladies with my group saw you on that date. I was very disappointed since I had seen Pope Paul on my previous Rome visit. I have traveled with the Catholic Pilgramage group previous to Rome. I dearly love you becaue you are humble, kind, sincere and to the point. I was hoping to see you out and about by chance in Rome, as some other groups did recently. I wish you the best and keep up your great work, we need more people like you. I listen to Relevant Radio and laugh at the humble stories they tell about you. I kept a copy of your speech of June 19, 2013 as a keepsake. I am so proud to be a Catholic. I pray everyday for you and your intentions. I am in the Legion of Mary and love the work we do. I pray the Rosary and Tessera every day! I also pray the prayer of the Beautification of the Servant Frank Duff. I love praying ,but I like living God’s Word! know God must really be proud of you, to represent him here, on earth. I have not heard one bad thing about you from any one, so what a wonderful job you are doing. and may you get through to the whole world, and may there be peace on earth. I hope you receive this. Just in case you don’t, I am writing a letter to be sent in the mail. I think it is time that our church allowed priests to be married as they were in Christ’s time. Jesus chose married men to be his apostles. We should not be different. We have married deacons who do great work for our church. In our diocese (Gary in Indiana)the wives attend classes so that they have a better understanding of their husband’s work. I think the same could be put in to practice for married priests. Some priests will choose to remain unmarried and that is okay. The married state is not for everyone. True, a married priest does not have as much time to devote to the church’s work because he has a family; however, a married priest would do very well as an assistant or as a pastor of a smaller parish. Some of the parishes in our diocese have become so large that people feel lost. They have no real connection to their pastor. They do not feel as if they have a mission because the priest is unavailable. It is true that we have many lay clergy who do a wonderful job of filling in the spaces, but it is not the same. Please consider reinstating the married priesthood. We need these wonderful men to guide and lead us. May God bless you and watch over you during your time as our Blessed Pope. Yours in God, Garry Rogers, Nova Scotia, Canada. I was delighted to see the visit to Brazil. Hopefully,you can visit Bogota, Colombia. Also, Florida. The city where a boy was killed and at trial the attacker, Zimmerman, was found not guilty in court. Your presence is needed there. Good morning your Holiness. I am writing to you about the concern for the poor. I am a student at Christ the King Seminary in Western New York. You have reached many people in your messages about those who do have. I believe in what you say about putting those individuals who have nothing first; however, I also see that true believers everywhere need to be united in, “One Lord, One faith , and One baptism. I am not Catholic but I do believe in what you are saying. I believe you can change our world and help others too see that we are just servants sent by Christ help pothers. Horace Cromer. I was is Buenos Aires from January 18th to February 18th of this year for the very first time in my life. I feel so touched that your people there said so many good things about you and they told me that you would never be chosen Pope because of the way you lived your life. The Holy Spirit is truly in charge!I have been so disappointed in the actions of my mother church. I do not believe that an institution is divine! I too am poor, many are poor but not just for food, but they are poor in spirit, they give up hope for a better future. They have lost the will to fight because the strong and wealthy continue to oppress them. Will you stand up for them? for me? I will stand up for you I promise you that that will be my commitment to the Christ in you and I. My confirmation name is Francis of Assisi. My mother and father raised 15 children and she was a life long member of the Third Order of St. Francis. I met Pope John Paul 11 in Rome and gave him a special necklace of my people for traditional leadership. I believe he wore it well. I hope someday we can meet each other and share our love for life. God Bless you my friend, Ali’i Sir Paul K. Neves Knights Grand Cross Knight of the Royal Order of Kamehameha 1 of Hawai’i. I am so glad and thankful to Our Lord that you are our new Pope. Thank you for all your good work with the poor. May God bless you. According to my present accepted view Pope Francis is the final Pope or Prophet before the worlds knowledge of the presence (Prousia) of the Lord Christ. PS: Your Lord God is Present among us, walking around as an ord9nary human. The Present Pope is one of the two most important offices on planet earth. To Pope Francis, May god bless you. Thank you for being our pope of the world. May I have your picture to put in our home. I implore you to use your influence to prevent the United States from entering into a war with Syria at the present time. While the deplorable acts against the people there is morally reprehensible, President Obama condones the murder of 1.3 million unborn babies in the United States alone each year. Please encourage our leaders to more fully examine the facts and join with other nations in a joint effort to punish the responsible perpetrators of this atrocity. I have served as Executive Administrative Assistant to two bishops here in the Diocese of Nashville, Tennessee and I rejoice with them in your election as our Pope. May God bless you and keep you healthy and safe always! We are asking for your help. In Cuba, for years the group of ladies known as ‘Las Damas de Blanco’ have been grossly mistreated by the Cuban Government. Throughout this time, we have not seen any action by Cardinal Jaime Ortega y Alamino to protect the abuse suffered by these ladies on their way to Church. Instead we have seen Cardinal Ortega ‘all smiles’ in meetings with dictator Raul Castro. His Holiness, please, the least Cardinal Ortega should do is to wear his pants and show his support by escorting Las Damas de Blanco on their way to Church and back. Dear God, Blessed Virgin Mary & Saint Joseph — What GOOD can you do with this Very Lazy Destructive Addictive Abusive Stupid Foolish Brother, Joseph Hung Hoang, that you gave me ???? All we have left are just only destruction, suffering with aching pain & grieving everyday of our whole lives because all of his life he has constantly been walking in darkness !!!! A totally lost soul — physically, mentally, spiritually & psychologically !!! I cannot even save his soul, how can I pray for others ???? Yet, I am not a saint and my brother is the Unlucky one !!!! God bless Pope Francis !!! I wish there were some way to let you know how you have changed my life. Born and raised Roman Catholic, I let the Church and My Faith become secondary in my life. On March 13, 2013, I was reborn and have embraced my faith and come back to the Church. Pope Francis, you were the instrument that made me whole again. When I first saw your face, I was filled with the desire to embrace my faith again. You are truly a man touched by God. Among my prayers, I pray for you to continue your great work and I thank God for allowing a man like you to have changed my life. Bless you. Beloved Holy Father, I am sure you will never read this, but I am asking for your prayers for my brother Allen in Fargo, ND, USA who is having surgery on Monday, September 16 and probably has lymphoma. My oldest brother, LeRoy, has advanced kidney cancer, and now this. Thank you so very, very much. I pray for you every day. I love you. May God bless you, as he’s blessed us with you as Pope, and keep you safe from all harm. I’m so full of thanks, so grateful; it’s humbling and hopeful. I know you won’t/can’t change basic Church doctrine – that is fine, as many are the ideals to which we must aspire, which guide us all to be each others’ brothers and sisters in Christ, but your words thus far have turned on lights, opened windows, and let the Love of God shine on us all. Thank you. Mama Mary, pray for us. Please take care of Pope Francis I and Father Benedict XVI. Most Sacred Heart of Jesus, we trust in You. I always remember you my/our holy Father Pope Francis. Thank you for all the prayers. PAPA,YOU are cherished. I pray for you every day. I will be at a 3 day retreat at a Jesuit retreat house this weekend where I will lift you in prayer before the Blessed Sacrament. Please pray for my 27 year-old son, Joseph, who is homeless and has lost his faith despite all my efforts to teach him. I sometime blame myself for his circumstances because I was an unwed mother .I have confessed this, but I cannot forgive myself. As one that basically had to “nail my shoes to the floor” to keep from leaving the church, your call to be our Shepherd has renewed my faith personally and in the life of the church. Prior to your election prayers went to God, our Lady and the Saint, through the Holy Spirit to guide to conclave of Cardinals. Everyday You, your Cardinals, Bishops, Priest, Papal Household, Magisterium are prayed for to the Holy Spirit for guidance. Holy Father, we ask that You proclaim the 5th Marian Dogma, our Lady of all Nations, OUR ADVOCATE, MEDIATRIX AND CO-REDEMPTRIX. It is the 1st of October, the month of the Holy Rosary. We will join you in all your prayers etc., in The Divine Will. God bless You and we pray that Mary will always be beside you. I am fifty-five and a product of an affair my mom had while she was married. I have many brothers and sisters. I am the only one of them who has never stood on solid ground. Every time I believe things are coming together in my life, as far as jobs, a love life, friends, a place to belong/home. The rug is pulled out from under me. I’ve never done drugs, i may have a little wine during the holidays, and I don’t curse. I’ve even been told I was “too nice”. I’ll give what little clothes or food I have if it’ll help you/ put a smile on your face, and make you feel good. I love doing that. There has never been a time in my life I can recall my prayers for me being answered. If it is said that the sins of the mother is not visited on the child. I’d rethink that. Dear Holy Father: It would appear in todays confused and tumultuous world, that this evil is not simply relegated to the secular world , but has entrenched itself within the Church hierarchy itself. After reading some of your comments it is quite obvious that you suffer from the same affliction many of our bishops are plagued with today, namely they are clueless as to what their job description entails. To govern responsibly, teach their flock and sanctify that same flock. It seems simple enough, doesn’t it? We really don’t need any more rhetoric or inane comments,we need bishops appointed who actually possess the faith, and have the courage to proclaim that faith, one cannot give what one does not possess themselves. If you do nothing else in your pontificate, gives us good and faithful bishops, and the problems afflicting the church will resolve themselves, we certainly don’t need any more wolves scattering and devouring the flock, we have enough of these already. Your early months as Pope have promised wonderful things for peace and understanding among all people and religions, including the forgotten of the world. It was distressing, however, to hear that you have declared that animals do not enter heaven because they have no souls–distressing coming from a Pope who assumed the name of the Saint who most expressed love for ALL God’s creatures, and that you would presume to know so absolutely and finally God’s plan for His Creation. Perhaps you never knew the companionship and affection of a domestic animal, or a dog or cat’s seeking out a human for play, or looked into its eyes to see profound if simple signs of emotion and intelligence. To view God’s “lower” creatures as inferior, not only in degree but in kind, from the human creation is, I believe, a form of arrogance and failure to appreciate (as St. Francis was able to do) God’s animal kindgom, including the bird’s who were so precious to St. Francis. Thank you for a fiery blessing. Have you read “The Gift Of Self” by Maria Pia Campanella? In 1954, I was baptized Catholic at St. Therese’s in N.Y.C. In 2005, a flaming desire to follow in the footsteps of Dorothy Day ignited during my first of soon to be 8 trips to both sides of The Wall in Israel Palestine. Dorothy Day has been the ‘patron saint’ of my internet newspaper WeAreWideAwake.org since its inception and the mission has been to tell the Palestinian Christian and Muslim side of the story in the Holy Land since 1948 and USA policies that collude in Nuclear deceptions and immoral and illegal occupation of the indigenous people. I have also been persistently praying to God and Dorothy Day to lead Leaders to END Nuclear Deceptions and FREE ALL the captives-in particular Mordechai Vanunu, Israel’s Nuclear Whistle-blower. Vanunu readily replied, “My human rights have been denied me because I am a Christian. When I was on trial, I was treated just like a Palestinian: no human rights at all, and cruel and unusual punishment, all because I told the truth. The government spread slander about me, that I was a homosexual, that I hated Jews, that I wanted fame and money. What I did was sacrifice my life for the truth. In prison, I really began to feel like Jesus and Paul. When Jesus threw the money changers out of the temple, it was like me in Dimona, exposing the Israelis’ dirty secrets. I felt like Paul, being thrown in prison for speaking the truth. I told him, “In America, we are assured inalienable rights. That means they are God-given rights that governments cannot take away, such as the right to worship where and how we choose. When I read that you were not allowed to go the few miles on Christmas Eve to celebrate mass at the Church of the Nativity, I wondered, what kind of democracy is that? I cannot understand how a democracy could haul anyone to jail because they wanted to go to a church in the next town. American democracy ensures citizens the right to think and to speak out the truth as we see it. American democracy understands that everyone has the right to a life and to liberty–which means freedom from captivity and any arbitrary controls. Last night, at the Interfaith Conference, I remembered what President Bush promised at his second inauguration, and wondered if he had thought about Palestinians when he delivered it. dear papa, we love you nd your thoughts n deeds. we need the courage that u take now to nurture ur floks. we r with u papa with our love n prayr. And a warm loving welcom to thrissur headed by Mar Andrews Thazheth nd Mar Raphel Thattil in Kerala in INDIA. And it is a dream. Bless us papaa…. I AM A ROMAN CATHOLIC TEACHER.SEARCHING A BETTER JOB IN MISSIONARY SCHOOL. I HAVE DONE MA,B.ED AND P.HD IN HISTORY.MY TOPIC IS ALSO BASED ON CHRISTIANITY-”CHRISTIANITY IN NORTH BIHAR”.BUT THE VERY UNLUCKY THING IS THAT I HAVE STILL NOT GOT A BETTER JOB.OTHER INSTITUTIONS ARE NEGLECTING ME BECAUSE OF MY TOPIC.BUT I HAVE A GREAT FAITH ON OUR SAVIOUR JESUS CHRIST.I HAVE ONLY A HOPE OF RAY IS ONLY YOU TO HELP ME. I HAVE TRIED A LOT IN LOYOLA SCHOOL RUNNING BY S.J FATHERS BUT VERY SORRY TO SAY THAT THEY ARE ALSO NEGLECTING ME . KINDLY DO SOME THING FOR ME AND FOR MY FAMILY MEMBERS.I HAVE TWO KIDS STUDYING IN LOYOLA SCHOOL JAMSHEDPUR ,INDIA.KINDLY HELP ME AND STRENGTHEN MY FAITH ON GOD . THANKS A LOT IN THE NAME OF JESUS OUR SAVIOUR. REQUESTING YOU FOR HELP ,I NEED A BETTER JOB IN LOYOLA SCHOOL, JAMSHEDPUR, JHARKHAND, INDIA, RUNNING BY SJ FATHERS.WITH GREAT HOPE I CAME TO REQUEST FOR THE SAME .THE LOCAL BODIES ARE IN CHRISTIANS FAVOUR.KINDLY DO SOME NEEDFUL HELP FOR ME .THANKS IN THE NAME OF JESUS. My heart jumps with joy when I hear you tell of living a holy and simple life. The life that Jesus wishes for us. May He continue blessing you and give you much spiritual strength to. Please pray for my 55 year old son John who I’m afraid is lost to drugs and alcohol. I pray daily for Jesus to create in him a new spirit. One of holiness and forgiveness. Also, please pray for me. I have severe copd and am living with 40% lung capacity. I pray daily for the strength it takes to live with this horrible disease. I saw a message in the church today in which you wrote asking young people to take the initiative and to be decisive. Today I am buying a new house. Please bless my decision, and may God help me to make it holy and welcoming. I am not Catholic but I would like to express a message to you. Please read the entire thing. I grew up as a practicing Lutheran. A time came that I became disenfranchised. I went to many different denominations: Catholic, Baptist, Episcopol, Methodist and a non-denominational Church or Christ(not LDS…I couldn’t take their bigotry). While living in Las Vegas Nevada in the USA, I had a girl friend that bullied me(for many months) to go to church with her. I finally did. You know what I found…the first church that preached Jesus message with words AND actions. This “Church” was actually part of an abandoned store plaza in the worst part of town. One Subday I was sitting in church and this very dirty & smelly individual came into the church during the sermon. The preacher stopped his sermon, said to the man he would be with him in just a moment. The Preacher finished his train of thought then handed his lesson to a Deacon. He walked to the man waiting in the back of the church and brought him to a room in the back. What I didn’t know at the time, there were rooms in the back that food and clothing was stored for the needy. The Preacher gave the man food and clothing…as much as he could carry. My whole life I have moved around, as a child to go where my father could find work, as an adult I entered the military then left and married a military man. I had never seen anyone actually practice what Jesus taught. I knew this was what I had been looking for all my life. (Know that my Grandmother was always the one who told me that I would find what I needed). I was baptized as an infant, but I made up my mind that this man was a true teacher…not a hypocrit, and I was baptized by him in the middle of the night. He waited for when I was ready and never pushed. I had to move and have found the same problem again, but I now know that I have seen a true disciple of Jesus and he gave me a gift that I carry in my heart. You Sir remind me of him. I’m not Catholic and don’t believe in your Creeds, but I believe that you are a true disciple of Jesus teachings. My husband and I read and talk about the scripture often. We have never found any teaching that supports hate, bigotry, anti gay sentimentality, sexism, greed and total disrespect for all people and things “beneath” others. You are a light shining in the dark. There are far too many hypochristians around the world. I argue that Jesus taught to feed and cloth the poor and care for the orphaned and widowed. We see these very people being ground under the heels of the more well off. Please continue spreading your word. If we don’t speak up for the poor and oppressed…who will? If I could shake your hand I would hug you instead. We all believe in the same God. Religion has to stop being used as a means of power…unless it is only used as a tool for love. Merry Christmas to you Sir and May God Bless You in all you do. I’m thankful for you and your messages. I am keeping you in my daily prayers. I am so glad that you were elected Pope. I love your thoughts on the Church and on God. You indicated that you believed in God but not a Catholic God. I am so happy that you are concerned for the poor. For so many years the Church was only interested in orthodoxy. You have put the bloom back in the Church for me. I have 3 beautiful sons, the youngest is gay. He is in a permanent relationship with a wonderful, talented man. We are truly blessed. Because his partner was thrown out of his home when he was 18, he has told us he is not religious. My son was brought up in the Church and used to attend mass weekly. When Cardinal McGarrick was at St. Mathew the Apostle Church in Washington, DC, my son and a group of his gay friends would go to Mass and out to dinner afterwards. In that church, we would see many gay men in attendance and some were serving as ushers. The new cardinal apparently made antigay statements from the pulpit and they seem to all have quit going there. At least that’s what my son says and I know he and his friends no longer go there. My son’s partner is happy to go with us at Christmas and Easter. I have been trying to encourage my son to go to a gay-friendly Episcopal Church such as National Cathedral here in Washington. I have been hoping to change the heart of my son’s partner into at least joining my son there. Christmas vigil was for all intents and purposes a disaster. My son lives practically next door to The Shrine of the Immaculate Conception here in Washington. I believed that taking all of us there for Mass would maybe impress my son’s partner with the majesty of the traditions of our church that maybe he would join us in wanting to be part of this incredible body of people. Here is what happened. We went an hour in a half early just to get a seat. Everything was so beautiful. The music was incredible. The Papal Nuncio delivered the homily. His message of the incredible beauty of all that the infant Jesus was to be was so meaningful. But then everything was destroyed in just a matter of minutes. He started to pontificate about the importance of only the traditional family of only mother and father. When we stood for the Nicene Creed, we just left. I felt sorry for a gay couple across the aisle from us. They were so happy to be there. By the time the homily was finished, they were slumping in their seats. I knew the day would come when I would have to stand up and leave a church because of this kind of message. I just didn’t think it would be Christmas Eve. My plan of trying to effect some kind of softening of my son’s partner’s stance on religion was totally sabotaged. I also felt a bit insulted because as a psychiatric nurse that has worked with teenagers, I can honestly say there are more nonfunctional “traditional” families around. Also as traditional parents, we must have not guided our son properly as he is gay. Holy Father, I urge you to bring in the scientific community to examine this issue. Personally I can’t understand the big deal of maintaining this anti-gay stance. My research says 1 in 10 males are gay. That is a significant minority. It drains the talent of the Church to lose these men. Please do something meaningful in regards to this issue. I am writing to ask his holiness to pray for my brother who has been diagnosed to terminal pancreatic cancer. Steven( my brother) has about 18 months to live if he undergoes chemo and radiation treatments. I am going to shave my head to support my brother. Unable to do any more than that. you are intervening in the problems of all the poor and suffering in the world. I implore you to take notice of my country India with its religious, political and many other problems and to talk to our church leaders as well as our political leaders to make our country livable for all people. May I ask for prayers for my family in extreme turmoil. That my grandson does whatever he can to heal the family unit. That the problem that caused this turmoil will be solved. I pray in Gods name. Thank you for your prayers your holiness . How would you define the ethical principals of your leadership on your people’s behalf? I ask this as a Christian (Episcopalian) who is most depressed at the daily attack on God, religion and Christianity. Any words of encouragement from you would be most helpful, Sir. Every generation has its own feeling of doom – this is mine in my 56th year of life. Thank you for your time, Pope Francis, and may God bless you in helping us all find encouragement and guidance in these times. i am a catholic i want to speak with pope francis, am praying for pope.i want speak. God Bless you Pope Francis our family will keep you in our prayers. Please keep making the correct decisions for your people. Thank you. I don’t know where else to turn. Lord knows I wouldn’t be bothering you with my little world if I didn’t think it was that important. I am 59 years old. I am raising my fifth and last child but I am doing it alone. By alone I don’t mean without God. I mean without her Dad or her Grandparents to help me pay for a good education. They have all gone home to God. Many might say, so what, lots of people do things alone with a mediocre education and they turn out just fine. Maybe so but I don’t want to wait and see how poor education doesn’t help my daughter do all that she is meant to. She deserves to be happy, peaceful, and in a supportive learning environment. Hannah graduated from the 8th grade catholic school last May. We tried Public school this year frankly because I was getting tired of asking for help all the time. Bottom line is we made a giant mistake. Public High School where we live has been terrible. I just need someone or some group or anyone who cares to help me give my daughter the opportunity her Father would have given her if he were here. When my husband was alive and after I have been faithful, Committee after committee, project after project in every Parish we ever belonged to. Eucharistic Minister, Evangelization Committee, St. Vincent DePaul, Martha and Mary committees, planning committee for Days of recollection, Ultreya planning committee. Cursillo Teams, Fiesta and Festival committee and Booth leaders, Athletic Association, Alter Servers, teaching CCD. I know that I did all those things because I wanted to work with God not just stand by and watch. I am writing to you today because I need someone who would like to help my daughter go to Catholic High School where she belongs. She is the salt of the earth, smart, caring, soft spoken and she has a great purpose I just don’t know exactly what it is yet. But I do know she is going to make a difference in the world. Thank you for listening and God Bless you. Decolores my Friend! HAVE A BLESSED HOLY DAY! PEACE, JOY & HAPPINESS ALWAYS! I am very disturbed to hear you say that the “Extraordinary form” of the Holy Sacrifice of the Mass is a “fad”. I belong to a large, devout, Latin Rite parish. We have an abundance of young couples with their many children. People come from other states just so that they can discover or recover the Mass that fed and sustained Catholics for hundreds of years. The Novus Ordo Mass is a “fad” and a fabrication. It is a terrible corruption of the good, the true, and the beautiful. The Church has lost millions of laymen and clergy due to the emptiness and protestant-leaning new form which is more of a 1970′s rock performance than the re-creation of Our Lord’s saving sacrifice. You are very popular with our modernist, secularist world. That should disturb you greatly. The Church, and the Pope in particular, should be countercultural when that culture is corrupt. Praise from Obama and the popular media is damning praise. Seek rather the kingdom of God. May God bless you and lead you to look to sacred tradition, not to the “relevancy” of a misguided world. Pope Francis, I have newly rejoined my faith after having been away for about 20 years. I live in California add belong to St. Kateri Church. Although I enjoy the sermons and the mass most days, lately the focus has been “give money”. Although I undertand the need for donations, I really miss the focused sermons that get me through the week. Can the church not reach out individually and personally to parishoners and leave Sunday service for true worship, learning and greater understanding? Bless you Pope Francis, just trying to learn and understand…again. Your Holiness: I am appalled at Archbishop John J. Myers’ extravagant retirement home in New Jersey. I realize this is the second time such retirement extravagance has been publicized and believe it is a serious matter. Consecrate Russia to Her along with the Bishops, please. She has been waiting so long. You know father, I was a child brought to the church to pray every day when I was 9 years old by a visiting Aunt from England. I became very religious at a young age because of this exposure to the church. I lost my enthusiasm when Father Xavior asked my religious instruction class “whose parents do not go to church”. No one raised their hands although I knew most of my classmates’ parents did not go to church. I raised my hand because I wanted to respond honestly – Father Xavior said “tell your parents they are Heathens and Pagans” in front of the entire class. I was very shy and humiliated. He also said “do you know what a Pagan is” and proceeded to tell me! Even Sister Mary looked at him in dis-belief! Then there was what in my later years what I called “surprise confession”. My parents required us to go to confession – Father Xavior had a few old people in line and Father Henry (a Spanish priest who spoke 5 languages)who always listened and never pried and let us all off with 3 Our Fathers and 3 Hail Mary’s no matter how terrible we thought the sin, and he had a line of adults and a long line of children. Since we only went to “Religious Instructions on Tuesdays”, we never thought we would have to confess on a Tuesday. We all marched in and I was the only one who had no head covering, so the Mother Superior put a piece of note paper on top of my head with a bobby pin – totally embarrassed. Then, of course, Father Xavior was the confessor. I racked my brain but could not think of anything to confess since Saturday, so knowing I would be grilled I made up some standard sins and then as my final sin said “I also lied”. This seemed to make him happy and after a liturgy of admonitions I was released to make my penance, which I recall was not as lenient as Father Henry. I visited the church again when dating my husband and we met in church each Sunday and even attended the breakfasts the church offered. As a child I had attended a Franciscan Church and loved Father Henry and this Chapel was also attended by a Franciscan priest. We left Germany and had our first child baptized in the faith – a Jesuit priest chastized us for waiting 6 months to have our child baptized and then we never had our children attend church as we were humiliated at the things this priest said to us. When I really needed to see a priest, I went to the local church and found that the doors were locked in mid-day and no sign of anyone. I was told the church was only open on Saturday during confession and Sundays. When you need to speak to your priest where is he? Maybe you could do something about keeping church’s open and forgetting about theft – in “Les Miserables” that priest never considered the riches of the church more important than the salvation of a soul! Please change things so I can go back and be that child of 9 years old and feel welcome by someone like Father Henry who was a wonderful loving priest! Pope Francis please clean up the corruption. The Diocese of Pittsburgh is in a major cover up and they are throwing a good Priest under the bus for being a whistleblower.